One of my biggest pet peeves about reading entertainment reviews is the employment of the five-star rating system (and its many cousins such as the score out of 100, and A-B-C grade). Some argue that such a system allows readers to quickly gauge if a movie is worth their time without having to read through the entire article. Other times, the individual opinions by critics are averaged so that the reader can get an idea of the general consensus. Unfortunately, the fact that a movie is rated 23% or 2.3 or C- tells the potential movie-goer absolutely nothing about whether or not they will like the movie. (Thus producing a crowd of angry consumers commenting that the critics must be crazy or stupid because such-and-such movie was completely awesome/horrible). In exchange for its simplified convenience, the number scale sacrifices meaning by obscuring the subjectivity of the ratings. Movie reviews are completely useless unless you know the theoretical stance of the critic (Do they care about… the acting? how realistic it is? representations of women? What is their own social/religious/political background?). No writer or critic is objective or innocent in this respect. If the critic is judging the movie with standards that are not in line with your own, then their numeric rating says nothing about how much you will appreciate said film. By turning an expression of taste into numbers, language is undermined and meaning subverted. The five-star rating system makes the faulty assumption that a person’s perspectives on a book or movie can be characterized as an objective degree of excellence. Most importantly, it assumes that taste is the same for any audience. It fails to consider either sociohistorical context or individual response. But numeric rating systems are only the tip of the problematic iceberg of reviews. The truth is our society places too much value on emotional appreciation, reader response, the pleasure principle, or whatever else you want to call it. People assume that their emotional reaction to a literary work is equivalent to how “good” the work is (i.e. its literary value). Too often I hear students talk about how much they dislike the novels they read in lit class, wondering “Why are we reading this? It’s so boring/bad/lame/hard.” Unfortunately, their aesthetic “judgment” of a text is based on a visceral reaction rather than intellectual analysis. Perhaps my beef with those silly stars is that they are a gauge of society’s Id-driven pleasure principle rather than an actual examination of aesthetics. Anyone and everyone can write an amateur review and talk about what they liked or disliked, but I am wholly uninterested in that kind of instinctual subjectivity. Reviews push prescriptive agendas of taste; criticism, on the other hand, speaks of technique and device, interpretation and meaning. I’ve been contemplating what to say about Wanted ever since I saw it two weeks ago. I realise that my procrastination has made this review a little irrelevant, especially given the cinematic resurrection of Heath Ledger in The Dark Knight this weekend. However, should people choose to care (or read), I’ll still give my two-cents worth. There are only two reactions to this sort of thing: either amazement at how awesome that was or amazement at how incredibly stupid this whole thing seems. If you too would love to make your morning coffee in this way, this is your kind of movie. But if you require at least an ounce of realism in your movies, then you’ll probably find yourself rolling your eyes through the whole thing. The problem with Wanted is that it refuses to acknowledge its own absurdity. Other superhero films contain protagonists with clearly superhuman powers and they are singled out by their costumes or weapons of choice. They revel in their realization of boyhood fantasies: flying, conquering over bullying villains, and blowing things up. Wanted, on the other hand, actually attempts to masquerade as something that could actually happen (its main character being powered by simple adrenaline and backed by a semi-typical group of assassins). Other “possibly real” unrealistic things in Wanted: curved bullets (some people in the theatre actually seemed to believe this was possible if you swung your arm hard/fast enough… uhh no), and the recovery bath of wax (clearly a poorly constructed plot device so that the characters can take more pummeling in a 2 hr time frame). Of course, realism is not a necessary component of a good movie (see Eternal Sunshine of the Spotless Mind). However, the other elements that hold together the vast exaggerations of Wanted are a bit threadbare. Given advances in technology, the amount of gore films can show has definitely increased and Bekmambetov capitalizes on this by not only adding more violence, but also painfully inserting slow-motion blows every single chance he gets. Some may say its stylistic, but by the 20th slowdown of a curved bullet’s path, it gets tiring. The narration throughout was mildly irritating and oddly placed, although the pay-off at the end may have been worth it. In fact, my general opinion is that the concluding remarks with its echo of the beginning sequence saves the film from being pointless, transforming it to satisfyingly triumphant. The Loom of Fate (nice allusion to the Greek Fates, I’ll admit) and the ancient society of assassins are both key factors in the film that are never really explained. In the end you’re still left wondering: Who’s sending them these codes? Is this Fate synonymous to God? Or if the sender isn’t divine, aren’t they just as bad as Sloan (Morgan Freeman) who decides to kill other people to save his own skin? It seems odd that Sloan claims the path he offers frees Wesley from Fate when the Fraternity is actually governed by the codes of an unseen weaver. Also, the mantra “kill one, save a thousand” definitely treads on some troubling moral grounds. After the initial embrace of and subsequent rebellion against the Fraternity and its values, the audience is left unsure of what the “take control of your fate” slogan of the film really refers to. Despite all this, Wanted (and James McAvoy) still manage to charm you into overlooking all these flaws. Against all reason and better judgment, you’ll find yourself swept into the action. Perhaps the lure of the summer action flick is its ability to make you forget all the logic, schoolwork, and reasoning that you acquired over the school year. You know you’re wasting your summer and that you have better things to do (or watch), but it’s summer, so what the hell. Note: will include spoilers, but personally, I think most G-rated movies are too predictable to be spoiled that badly. Seeing Wall-E in a packed theatre last Saturday, I realized that the movie theatre climate has been drastically altered since I was a wee child. Just as the Harry Potter books invaded the New York Times bestsellers list, Pixar films have become a serious contender in the fight for opening weekend box office sales. The difficulty of producing a meaningful children’s film (or novel) lies in balancing a message that shies away from both sentimentality and pedantry with an equally important need to entertain. Too often G-rated movies either sink into meaningless antics and gags or feature overly sappy scenes about the importance of family, love, and self-identity. 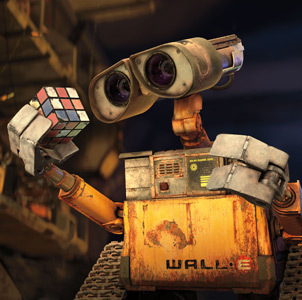 Luckily for moviegoers, Wall-E makes neither of these fatal mistakes, never for too long anyways. The thing that I found most intriguing about the film was its ability to tell a story with such sparse dialogue. The first half of the film, especially, reminded me of Charlie Chaplin and the wonders of silent film. Wall-E and his love interest Eve repeat their names countless times throughout the film and yet, each time it is said, it carries a different intonation and nuance. Wall-E really makes you think about the importance of body language and what aspects of expression are most integral to being human (for any character, whether robot or animal, only gains our sympathy through its human qualities). Visual effects have always been Pixar’s strong suit and they definitely show this in the detail they put into humanizing their robots. Wall-E, a shy, lovestruck robot, would probably have been a nerd if he was a human being and his characterization seems to coincide with the current trend that lauds the beta male who is often paired with a stronger, more dominant female character. Given the success of Knocked Up, 40 Year Old Virgin, and a string of other movies promoting the less-than-handsome, slightly awkward hero who wins the heart of a hot girl, it’s interesting and telling that even children’s films are beginning to follow this formula. Dirt-ridden and weathered, Wall-E is not the ideal counterpart to Eve, who is far more technologically advanced and (scarily) armed, and yet this endearing little guy somehow manages to win over her and everyone else. Setting aside the classic male role for something a little less perfect, the film industry is moving towards a more realistic portrayal of the average Joe. The unfolding of Wall-E’s love story with Eve was delightfully done and Pixar was smart enough to insert humor wherever the moment risked sappiness. The only scene that kind of made me cringe was when Eve holds hands with Wall-E to make him remember who she is; it seemed almost too precious given the repeated foreshadowing of this monumental event with the replaying of Hello, Dolly! on Wall-E’s tape. While we all care about Wall-E by the end, somehow the revival of a robot from the grips of death is far less poignant than, say, the death of Mufasa or the Beast’s resurrection as a prince, making the scene feel contrived as a not-so-subtle tying up of loose-ends. The opening shots of the movie eerily depict a futuristic wasteland left behind by mankind when Earth became uninhabitable. Tall skyscrapers made entirely of trash fill the screen as advertisements for Buy N’ Large continue to play in the empty city. The view instantly recalls the pessimistic warnings against mass consumerism and the destruction of the environment that have risen to the forefront of today’s political debates. The eco-friendly, “green” agenda, exemplified in Al Gore’s An Inconvenient Truth, is clearly evident in Wall-E, showing the extent that environmentalism, once mocked as the cause of tree-hugging hippies, has pervaded American culture. Even more so than the issue of environmentalism, the dehumanizing nature of technology and mass consumerism is ever present in the film. A spaceship full of obese people drinking their food from big plastic cups seems to echo the warnings of Fast Food Nation and Super Size Me while the isolation of human beings in individual hoverchairs and the trance-like state that the viewer finds the future generations of mankind in resembles the dystopias of Brave New World and Fahrenheit 451, where the problems of society are caused by self-induced ignorance and apathy. A particularly creepy part of the montage of life on the spaceship is that of the nursery where babies were being taught about Buy N’ Large products (“B is for Buy N’ Large, your very best friend”). Even the babies, it seems, are bombarded with propaganda. This indictment of modern life implicitly includes the role that technology plays in advancing such consequences. Ironically, it is a robot that seems most human in the film and ends up saving humanity. Interestingly enough (and in my opinion, a little disappointingly), Wall-E fails to give a definite response to the problem of Big Government (as symbolized by Auto and the president, who refuse to deviate from the set course) and excessive consumerism. The obesity problem is written off as the accidental result of living so long in space (which, by the way, is scientifically inaccurate – people actually lose muscle mass/strength) rather than the fact that the people in the film never exercise and gorge on fast food. In fact, the image of a sea of chubby people rolling around when the spaceship tilts feels like a joke made at the expense of an opportunity to address a greater problem. In addition, the rebooting of life on Earth is overly simplistic, celebrated with the planting of a single sprout (also scientifically impossible given the lack of genetic variety in one plant to ensure species’ survival). In the struggle between dealing with the big issues and giving kids a happy ending, happy ending clearly wins. With Wall-E and Eve’s triumph over Auto, the previously dehumanized human beings return happily to Earth and fields of plants randomly start to grow as the movie comes to an end. Perhaps such an ending is appropriate for the innocent expectations of children, but in a sense I feel like they got cheated out of a more meaningful message. The more pressing issues of today’s society take a back seat to robot romance and in the end, you are left unsure of what the movie actually thinks about the big problems that were brought up. 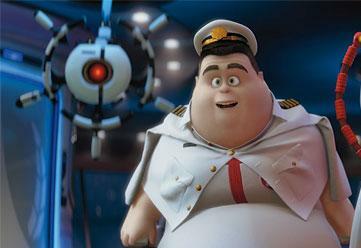 Nevertheless, this may indeed be part of the nature of its genre and Wall-E cannot be entirely faulted. Wall-E does well despite the constraints and flaws of its genre and definitely deserves to be one of the major blockbusters of the summer. The cute-factor of Wall-E cannot be denied; however, my general opinion towards Pixar goes unchanged: while they always do a great job with animation, witty dialogue, and humor, the plot frequently lacks a little extra depth.